There’s been a lot of coverage in the media this year on the topic of transits, with Venus making a transit in June for the last time until December of 2117. A transit happens when a celestial body passes in front of the Sun. Technically, a solar eclipse is also a transit (of the Moon), and we had one of those in May of this year. The last transit of Mercury occurred in November of 2006, an event that will repeat in May of 2016. Obviously, any transit visible from Earth would have to involve an object closer to the Sun than Earth. That would include planets Mercury and Venus primarily, but occasionally we see an asteroid or comet do the same thing. Special equipment is required in those cases, since they are very tiny objects compared to planets. Transits are described in terms of their contact times and transit chords. 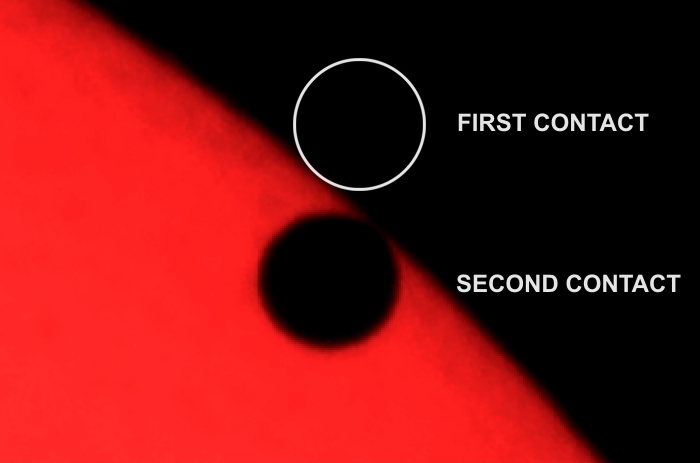 The photo above shows Venus silhouetted against the face of the Sun at the moment of second contact, the point at which it is completely “inside” the visible edge of the Sun. The circle above shows where Venus was at first contact. Unfortunately, for viewers like me in the Southwest, the Sun set before third and fourth contact. We didn’t get to see the entire transit. Those two contact points at egress (exit) are defined as the reverse of the ingress (entrance) contact points. The transit chord is the path taken across the Sun’s face. That path can be as long as the Sun’s diameter (rare), or be close to zero in the case of a grazing transit. The transit in June had a chord length of about 80% the Sun’s diameter, and lasted 6 hours 40 minutes. There’s a great diagram showing event geometry on the StarDate website (another excellent astronomy resource you might want to bookmark). Of historical note, there’s not much we can learn from transits these days. But the Venus transit of 1639 provided the first truly accurate method for measuring the distance to the Sun. Previous to that, astronomers only had rough estimates of that distance. Earth’s average distance from the Sun is currently known with high precision to be 92,955,807.273 miles (149,597,870.700 kilometers). Knowing that distance allows astronomers to put a scale on the size of our solar system. If you want to see the geometry of that distance calculation, the Exploratorium has a great diagram and explanation here. If not, here’s the simple explanation. Two observers at different locations on Earth have to time the moment of first (or any) contact using synchronized clocks. They must also measure the exact position of Venus in the sky. Surveyors call this process triangulation. Once you have the numbers, finding the distance is basic high school geometry. You also need the formula for Kepler’s 3rd Law of planetary motion — but that’s only high school physics.